"To make this simple remoulade sauce, combine mayonnaise, Dijon mustard, fresh dill, pickles, minced garlic, capers, lemon juice, and a dash of cayenne. This version has some body to it. It's easy and so much better than store-bought versions. Try it with crab cakes or pretty much any grilled, broiled, or pan-seared fish." Stir mayonnaise, cornichons, dill, capers, lemon juice, Dijon mustard, garlic, and cayenne pepper together in a bowl. 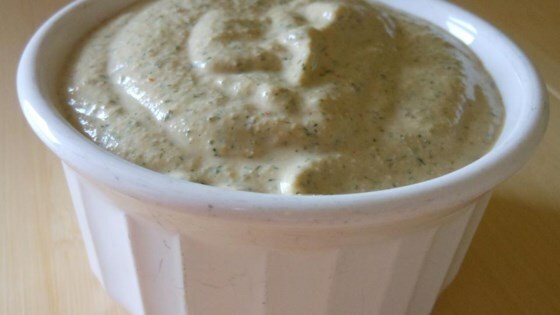 A simple homemade sauce for crab cakes and grilled or broiled fish. Unfortunately we didn't enjoy this at all. The flavor wasn't good. It wasn't like any remoulade I've tried before and was quite a disappointment. I substituted Sweet Gherkins because I couldn't find Corichons. It was still delicious this way. This recipe is over the top in flavor. I will never buy tarter sauce again. Thank you for sharing this terrific recipe with us. I really liked this. Added more dill and cayenne pepper. I put it on portobello stuffed mushroom with crab. This is so good with John’s Boudin Ball recipe. Worked wonderfully with Chef John's fresh salmon cakes. My guests really enjoyed!